I did not expect my last post to generate such a strong response from my friends and readers. But a good number of them had much to say about whether or not I should eat those onion rings. It was all very eye-opening, I have to admit. PLEASE DO eat the onion rings. They are a once a year treat. Eat them, savor them, love them, DO NOT FEEL GUILT OR SHAME and get back to your wraps the next day. Embrace that there is no guilt, only consequences. Man, I love that. The author is right. Talk about a perspective shift. It makes the whole debate scientific in nature. Cause/effect. Action/reaction. And removes any emotion from the equation. Exactly what I needed. Another friend, Heidi, said she has noticed that when people go through a drastic transformation such as weight loss, they become obsessed with the process of maintaining it “for fear that something would magically reverse itself. Like overnight the weight would start to return or they’d lose their motivation.” And again, this was eye-opening because I guess I’m sort of obsessed at this point, too. I joke about it, but those very fears Heidi mentions, irrational as they are, have crept into my head at times. I look back at photos from a year ago and read posts from my hospital stay and catch sight of my CPAP machine tucked away on the top shelf of the bedroom closet and think to myself how very fortunate I am to have overcome so many bad things and how much better my life is now which makes the slightest notion of ever ending up back in that same boat again a little terrifying. 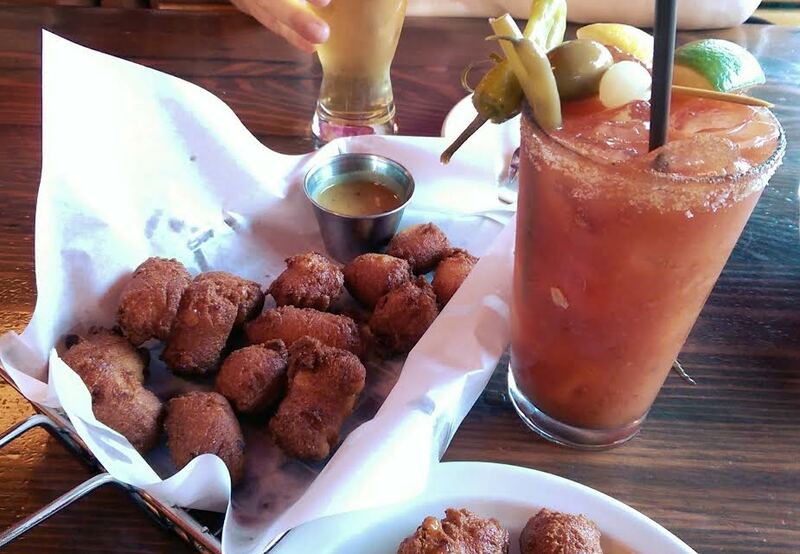 They’re hush puppies, not onion rings, but nutrition-wise aren’t exactly health food. Roughly 40 calories apiece and, of course, cornbread (hello, carbs). I may have limited myself to six, but it’s a start. As for the Bloody Mary, well, I never said I gave those up! Another good friend, Monica, supported my decision to refrain from the rings and asked yet another great question: Eating well means you aren’t enjoying life?! Bingo. I love broccoli, and it just happens to be a very healthy food. It’s not like I’m hating life whenever I take a bite! The bottom line is, it’s all about choice. You just have to decide for yourself what your own personal comfort level is. and where your boundaries lie. For me, that is apparently somewhere in between a hush puppy and an onion ring. It’ll differ for everybody. Part two to that equation: if you do happen to reward yourself with a treat, do not get your boxers twisted in a bunch afterwards. That about sums it up. Awesome show, and even though we didn’t get to bed until 1 AM and both of us had to work today, we had a blast. Doug Martsch is an indie rock god, and I can’t wait until we see him a sixth time. Hey Mark, I am soooooo glad that you gave in to your desire and decided to indulge! I totally agree! And it’s all about balance. I think you’re at a point in your health experience where you intuitively know how much is too much and can sense when to stop. Therefore if you indulge at times and give yourself a treat, I think you won’t go overboard. Btw, those hush puppies looked delish! Um, a big bucket of hushpuppies with some horseradish sauce and a tall, cold beer. If there was a heaven, that’s what we’d have every thursday evening right after work. Substitute the beer for liquor and I’m right there with you, buddy! Hush puppies are hard to come by in these parts. Glad you enjoyed. It really is all about balance. They’re definitely more a Southern thing. These were great, even if they didn’t look like golf balls as hush puppies traditionally do. You really do get to indulge now and again. I am on a journey of weight loss, slow and unsteady. But still I refuse to make it terrible, it is a life change not a diet so I won’t be giving up everything I love and I won’t fill my heart and head with guilt. I think there’s a lot of negative association with the word “diet” – it’s almost as if we are destined to fail if we call it that. “Lifestyle change” is definitely a more accurate description anyway, as it’s about so much more than food. You definitely have the right attitude. Best of luck on your own personal journey! Saturn rings are much more tastier and healthy than onion rings and do not give you bad breath and indigestion. Of course depending upon where you live it may be quite a drive to get to the Saturn rings store.